Sometimes the simplest things can make me laugh. What I love best, though, is when something makes me laugh AND think! Here’s one that happened right outside my window. My office has a second story view looking out into our back woods. We love feeding and watching the birds and are regularly trying out different kinds of bird feeders. To provide me with the best view, my dear husband secured a very tall post outside my office window, high enough to put a feeder at my eye level. When I’m sitting at my desk, I can look out and see all kinds of activity right outside my window. 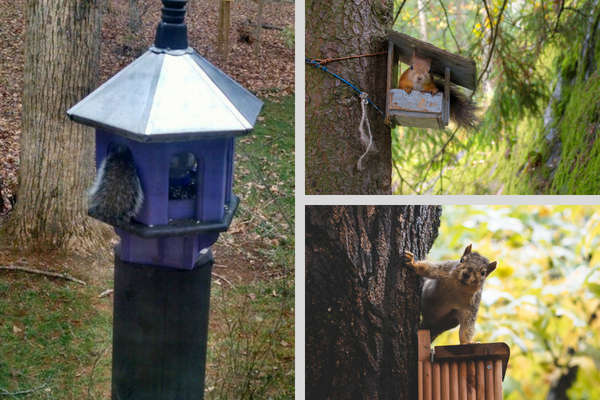 Squirrels are quite intrepid and innovative in their shenanigans to get to bird food—humorous too, if you choose to look at it that way. 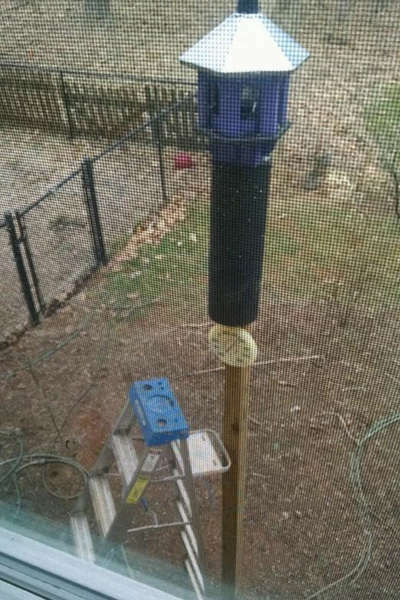 So, like any experienced bird lover, we placed a sleeve over the post to keep the squirrels from climbing up and getting into the feeder. It worked for months without a hitch. Then one day I looked out my window to see a squirrel’s bushy tail coming out of my bird feeder 15 feet in the air! I was so shocked to see a squirrel in that high feeder that I grabbed my phone at my desk and took this picture of it to show my husband. 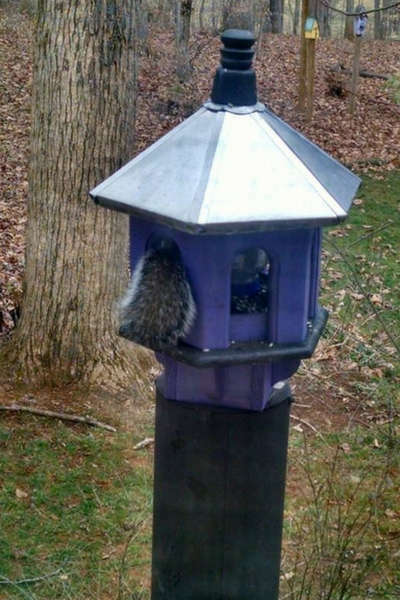 The feeder had just been refilled and that squirrel was stuffing himself! Honestly, as irritating as it is to lose so much bird food, a part of me felt he’d earned it. I couldn’t imagine how he’d gotten up there, but some reward for that feat seemed reasonable. Thus quelling my annoyance at the squirrel, I got back to work. A while later I stood up to get something and I glanced at the feeder again. The squirrel was gone, but from this new perspective I had an entirely different assessment of the situation! Here’s the picture I took from a closer window. I burst out laughing!! That squirrel wasn’t so innovative after all. I had left the ladder right next to the post after filling the feeder, so it was a simple leap for him to the top from there! A veritable invitation to the feast! My own actions—a simple mistake—were the cause of my subsequent irritation. I had been the squirrel’s accomplice. “Leader Ladder”: Tool or Trip Hazard? We often use a ladder as a metaphor for positive growth (e.g., “Climbing the career ladder”). In this case, when I used the ladder to fill the feeder, it was put to good use. We learn new skills, step up another rung and see a new horizon. In some cases, though, we leave our leader ladder unattended or we prop it against the wrong post, thereby inviting mayhem to join the party. In this case it was a squirrel. In other settings it may be more damaging. Opinions forged from experiences as an individual contributor or middle manager that got us to a certain rung may prove limiting unless examined and tested against new situations. Where do you leave your leader ladder? How often do we see something at work or at home that bothers us and we make assumptions and decisions based on that one view (OUR view) of the situation? It’s the squirrel’s fault, obviously! Let’s say a peer or report had tough information they didn’t share with you in a timely way. Obviously it’s their fault, right? Maybe. But where did you leave your ladder? When they’ve brought unhappy information before, were you open and constructive, or did you shoot the messenger? How did your prior actions contribute to the current situation? If you’re like most of us, you’ve left one of your ladders close by a situation that you’re having trouble with. It’s like that old Pogo cartoon “We have met the enemy, and he is us!” What you do next makes all the difference. Move your ladder or shoot the squirrel? There’s always the option to shoot the squirrel (metaphorically of course!). It’s a short term fix, at best. There are always more squirrels waiting for an unattended ladder, and without some reflection and learning, chances are good that you’ll put your “ladder” next to another “post” before too long. Newsflash, most leaders aren’t hired to shoot squirrels! Over the course of your career, the time you spend messing with squirrels rather than delivering on your key performance metrics will sideline you. It takes a higher level of maturity to walk around a situation and look for the ways you may have actually contributed to the problem; and higher still to share your findings and hold yourself accountable with the others involved. It is time and courage well spent. Moving your ladder can look daunting and unwieldy at first. It takes time that you may feel you don’t have. You’re vulnerable while you’ve got your hands full moving it. You can come up with lots of reasons to avoid the work of moving a leadership ladder that has become a trip hazard. None of them hold up over time though. And, in my experience, once you’ve muscled a few of those ladders around and turned them back into tools, those who see your sincere efforts will start offering to lend a hand. They might even ask for your help moving their ladders too. Where are your leader ladders? We’ve all got ladders. Lots of them! In any situation there may be many people’s ladders up against that same pole tripping anyone who comes near. But yours is the only one you’ve got control over. So, where are your leader ladders today? Are they well maintained tools for your growth and the growth of your team? Or have you left a few trip hazards around, getting in the way? It may be time for an inventory! After rolling on the floor laughing about that squirrel, I am struck with the importance of the leadership question embedded in your delightful story. One leadership ladder that served me well in the past to develop a good level of social and professional respect has been amiability, always doing my homework, and caution in choosing my battles. I believe I’m at a time in my life when I need to harness that social capital I’ve earned and be willing to invest some of it in fighting forcefully for the issues important to me and to what I believe I’m called to do. I’ll keep the amiability rungs of the ladder—and will continue to do my homework—but these times call for more courage than caution. Happily, I know there are lots of supporters who will help me move that ladder! Wow Elizabeth! What an excellent example of repurposing and expanding a valued tool for greater effectiveness in your current surroundings! Thank you for sharing that insight. The very things that got you where you are–your amiability, conscientiousness, and caution–may be trip hazards for what you’re feeling called to do now. Yes Ma’am, let’s put your ladder on a higher target and watch you go to town! I love this example!